Behind the scenes with Ken Collins, Shane Dorian, Mark Healey, Greg Long, Khol Christensen, and Grant Baker. The race course area for the 34th America's Cup in San Francisco has been revealed. Stretching across the city shoreline from Piers 27/29 out to near the Golden Gate Bridge, the course will bring the action closer to shore than ever before in the 160-year history of the Cup. "The input and cooperation we've received from Bay stakeholders and users has been invaluable in allowing us to reach this point," says John Craig, the Principal Race Officer for the America's Cup. He gave the first public presentation in San Francisco about what the course area for the Cup races would look like. "Now we can focus on setting up a race course that will allow the teams to compete and perform in a way that I think will really energize and excite this city." An Oracle Racing AC45 skippered by James Spithill sails past Alcatraz on February 21, 2012 in San Francisco, California. The AC45 is the forerunner to the AC72, which teams will race in the Louis Vuitton Cup and America's Cup finals in 2013 in San Francisco. The AC45 will be featured at the America's Cup World Series. Tucked between Alcatraz and the city shoreline, the race course offers up-close viewing from any number of locations along the city front, with the Marina Green and Crissy Field among the prime locations. The exact location of the race course area will change slightly on any given day depending on weather conditions. Environmental buffers and small boat access areas were prime considerations in setting up the racing box. A transit channel has been set up along the shore to allow ferry traffic, boats needing to transit in and out of the marinas as well as commercial fishing boats and other craft, to still operate safely during racing. The restricted area box is expected to be in place for three to four hours a day on scheduled race days. "Following consultation with numerous Bay users, the Coast Guard have issued a draft Special Local Regulation (now in the 90-day public comment phase), that defines a restricted area where we can safely set up our race course area," Craig says. Schematic showing the larger AC72, which Oracle Racing is building in a San Francisco warehouse, ready for launch this summer. The smaller AC45 is a prototype that sailor have been using for practice runs this week. Racing in 2013 will take place in the AC72 class; a new breed of America's Cup boats, these wing-sailed catamarans are on the cutting edge of design, engineering and technology. Outrageously fast and requiring a crew with great athleticism as well as vast reserves of courage to sail, the AC72 is designed for thrills… and spills. The 2013 racing season starts on July 4th, with the Louis Vuitton Cup, the challenger selection series, leading up to the America's Cup Finals from September 7th-22nd. A pioneering scientific expedition that will document the health of coral on the Great Barrier Reef will be undertaken as a joint venture between global technology giant Google, the UQ Global Change Institute, not-for-profit organisation Underwater Earth and insurance company Catlin. The Catlin Seaview Survey, announced in Singapore today, aims to carry out the first comprehensive study of the composition and health of Reef coral to an unprecedented depth range (0-100m). The project's chief scientist, Professor Ove Hoegh Guldberg from the Global Change Institute at The University of Queensland, said the scientific data gathered would strengthen the understanding about how climate change and other environmental changes are likely to affect ocean ecosystems like the Great Barrier Reef. “The visual nature of the project will also help bridge the gap between scientific knowledge and public awareness,” Professor Hoegh-Guldberg said. “The Catlin Seaview Survey comprises a series of studies which will reveal to the public one of the last frontiers on Earth: the oceans. Professor Hoegh-Guldberg said the survey was not just another scientific expedition; it aimed to capture the public's imagination and engage people with the science like never before. 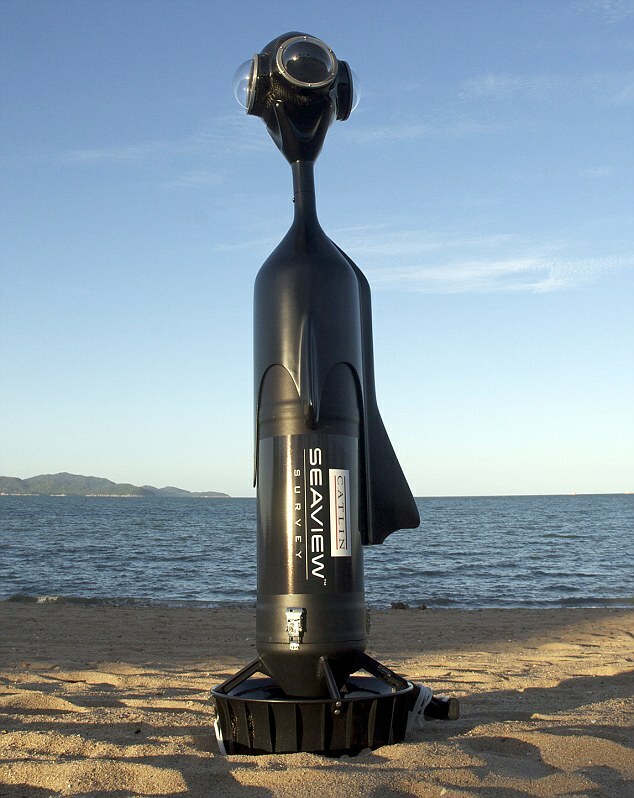 The Catlin Seaview Survey camera, developed specifically for the expedition, will capture thousands of 360-degree underwater panoramas. When stitched together, these will allow people to choose a location, dip underwater and go for a virtual dive at all of the locations visited by the expedition. Google is collaborating with the Catlin Seaview Survey and is working on a new feature on Panoramio (which links photos to locations), so that the 360-degree panorama images can be uploaded and made available to millions of people worldwide. This will eventually mean that roughly 50,000 panoramas from the Survey will be accessible on Catlin Seaview Survey in partnership with Google Earth and Google Maps. The project also will have a dedicated YouTube channel and the ability to broadcast Hangouts on air, which allows people to watch livestreams of the expedition team from the ocean floor. The Catlin Seaview Survey will include a shallow reef survey, a deep reef survey and a megafauna survey, which combined will provide a baseline assessment of the composition, biodiversity and wellbeing of the Reef. 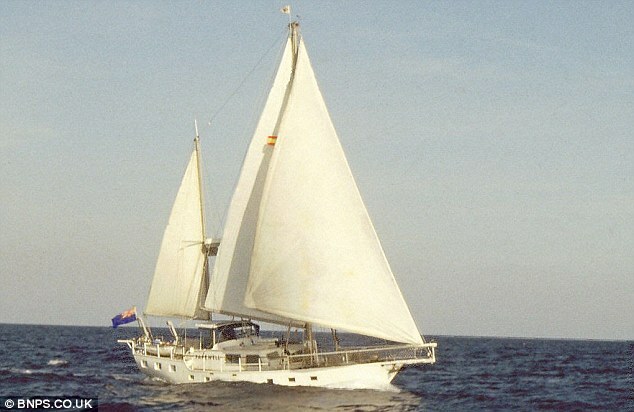 The expedition will launch on the Great Barrier Reef in September 2012. The Shallow Reef Survey will use a custom-designed underwater vehicle with a 360-degree camera to generate imagery of the reef. 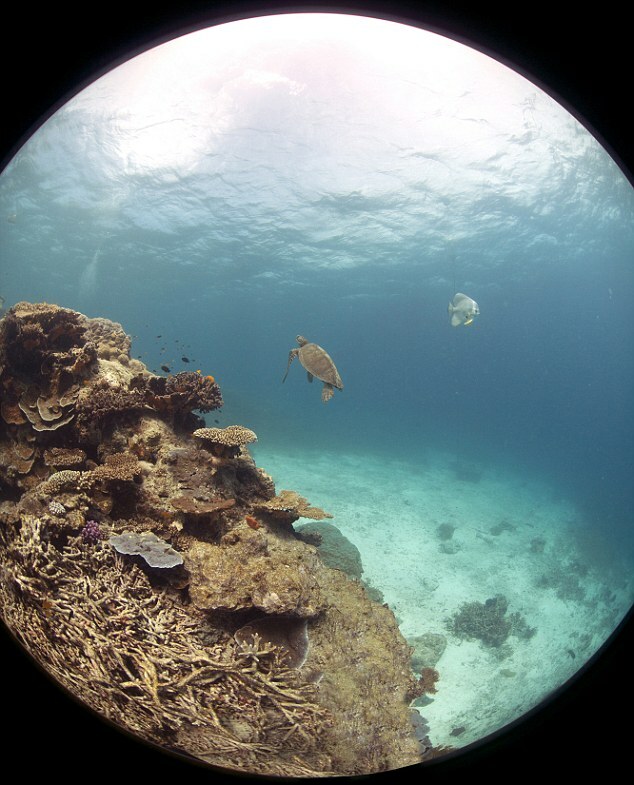 In collaboration with The University of Queensland, this will be assessed using image recognition software to enable a rapid visual census of corals, fish and many other organisms at 20 sites across the entire length of the 2300km Great Barrier Reef. 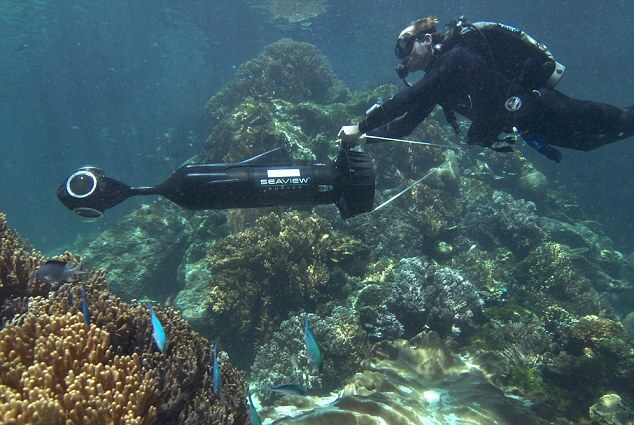 This will provide a broad-scale baseline for understanding climate change on coral reefs. The Deep-Water Survey will use diving robots to explore the reef at depths of 30-100 metres. Little is known of this region, yet it may hold some of the secrets of whether or not the coral reefs will survive rapid climate change. Using a combination of high-definition cameras, deep-diving robots and survey equipment, the deep-water component will provide a comprehensive study of the health, composition and biodiversity of the deep-water reefs. The Mega-Fauna Survey team, led by Emmy award-winning cinematographer and shark researcher Richard Fitzpatrick, will study the migratory behaviour of tiger sharks, green turtles and manta rays in response to increasing seawater temperatures. A total of 50 animals will be tracked with satellite tags that continuously monitor their geographic position, temperature and depth. This data can then be compared against oceanographic data to get a better understanding of the animals' behaviour and migrational responses to the warming of the oceans. The Catlin Seaview Survey is sponsored by Catlin Group Limited, an international insurance and reinsurance company. The Catlin Seaview Survey is collaboration between global insurance company Catlin Group Limited, not-for-profit organisation Underwater Earth (project creators) and partner Google. Over the coming years, it is intended that the Survey will be expanded globally to reveal the oceans in regions of importance all over the world. The Survey will also draw on the experience of some of the world's leading authorities on oceanography and climate change, with Professor Ove Hoegh-Guldberg (Director of the Global Change Institute at The University of Queensland) as Chief Scientist. Emmy award-winning cinematographer and shark researcher Richard Fitzpatrick will also be part of the Seaview team and will lead the mega-fauna survey. The Catlin Seaview Survey is sponsored by Catlin Group Limited. The global insurance and reinsurance company is committed to sponsoring scientific research into environment change. From 2009 through 2011, Catlin sponsored the Catlin Arctic Survey, which allowed researchers to collect scientific data about the changing environment in one of the most inhospitable regions of the earth. The Global Change Institute at The University of Queensland, Australia, is a new source of game-changing research, ideas and advice for addressing the challenges of global change. The Global Change Institute advances discovery, creates solutions and advocates changes to policies that respond to challenges presented by climate change, technological innovation and population change. An elderly couple who have spent the past 36 years sailing round the world have returned to the UK to retire. Bill, 83, and Laurel Cooper, 82, have travelled four times across the globe, visited 45 countries and survived a hurricane during four decades at sea. They sold their home in Chatham, Kent, and set off from Lowestoft, Suffolk, in June 1976 on a 50ft vessel Fare Well. They have moored their third boat, Faraway, on the River Medway after clocking 100,000 nautical miles. The couple decided to drop anchor for the final time at Rochester because their health was starting to fail. Mrs Cooper said: "We're still fairly healthy, except for his eyesight. "People think it takes a lot of money. It doesn't, it's a very cheap way of life really." 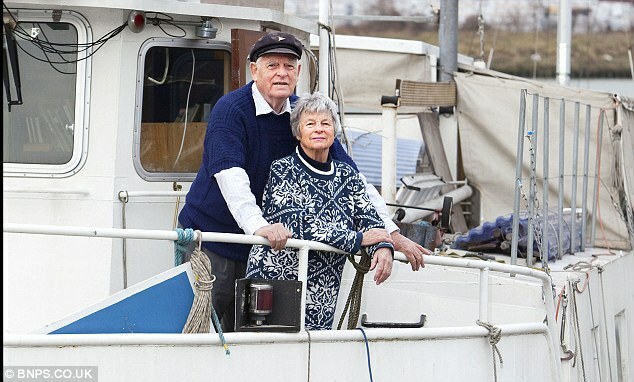 Their ocean-going adventures together began in the 1950s in a former Hitler Youth boat requisitioned by the Royal Navy. In the mid-1970s Mr Cooper, who had served as an officer in the Royal Navy, was working as a broker in the City of London and an informal adviser to Prime Minister Harold Wilson. He became disillusioned with life as a high-flying businessman and decided to give it all up. "The thing is in a boat like that, when you're navigating it and sailing it, there are stresses that you can cope with. They're concrete stresses, they're not abstract stresses," said Mr Cooper. "When you're working in a high-powered job, as I was in the City, the stresses are something that you can't really cope with. "You just really get fed up with it." Mrs Cooper added: "He'd been working on me for a very long time that it would be a nice thing to do. I'd got a lovely house, I'd got the kids, I'd got a nice little life going along. "I wasn't sure that's what I wanted to do." But with Mrs Cooper convinced, the couple said farewell to friends and family and set sail from Lowestoft in their 50ft vessel with their one-eyed cat called Nelson. "Take it as it comes, see if we like it, see if it's all right [is what I thought] and my goodness it was," Mrs Cooper said. As soon as they reached the Mediterranean Mr Cooper said he knew they had made the right decision. 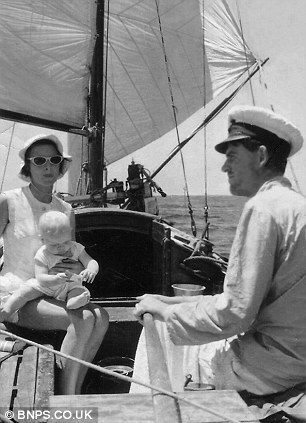 "Before we left I suffered quite badly from asthma and Laurel suffered quite badly from migraines and we got half way to Gibraltar and we realized we hadn't had an attack then, and never had an attack since. "Just cut off, lack of stress." Mrs Cooper said: "We didn't really have any trouble at all. The one time we did, he got a fish hook in his hand hauling up the anchor. "We sprayed it with brandy and gave him some to go down inside as well and I cut it open with a Stanley knife and got it out." 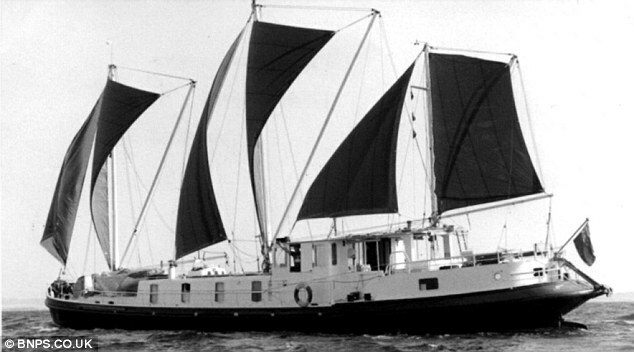 She told the BBC they had not set out for adventure but in 1982 they survived Hurricane Alberto north of Bermuda. Mrs Cooper added: "We were on our way up to Canada, we were hoping to see his relatives in St Lawrence [river] but we never got there in fact because of this hurricane. "It was 200 miles north and it was too late to turn back, even if that hadn't been an extremely dangerous thing to do, because there are a lot of reefs north of Bermuda so there we were stuck. Where are you going to get any help?" "We were the only boat in that area to survive it," Mr Cooper said. They said they did have the odd argument while they were on board the boat but believe their success at sea was down to their division of labour. "He was master and commander, definitely, no doubt about that," said Mrs Cooper. "I'm the practical person and I back him up. "He makes the decisions and I'm bound to say he made very few wrong ones." Iran's warships entered the Mediterranean on Saturday to show its 'might' to regional countries, as a high-level American official arrived in Israel. Iran sent two of its warships into the Mediterranean on Saturday as tensions with Israel worsened and a senior American official arrived in Tel Aviv. State television presenters in Tehran were triumphant after Iranian ships passed through the Suez Canal for only the second time since the Islamic revolution in 1979. Reports said they had docked in Tartus, the main port for Iran’s embattled ally regime Syria which has been convulsed by an uprising for almost a year. “The strategic navy of the Islamic Republic of Iran has passed through the Suez Canal for the second time since the (1979) Islamic Revolution,” said navy commander Admiral Habibollah Sayari. Iran's Navy Commander Admiral Habibollah Sayari announces naval drills in 2010. Israel immediately put its navy on alert. The deployment raised tensions with Israel at a dangerous time, with speculation growing that air strikes are being prepared against Iran’s nuclear programme before it reaches a point where it cannot be stopped. Dan Fayutkin, an Israeli Defence Force officer and expert in military strategy, said that the movement of Iranian vessels into the Mediterranean risked starting a war. “Any military move made now by either Israel or Iran would be hostile,” he said. Iranian spokesmen did not say how many vessels had passed through the canal, or what missions they were planning, but said the flotilla had previously docked in the Saudi port city of Jeddah. Two Iranian ships, the destroyer Shahid Qandi and supply vessel Kharg, docked in the Red Sea port on February 4, according to Iranian media. In February last year two Iranian vessels passed through the Suez Canal, soon after Egypt’s revolution, for the first time since 1979. Iran’s navy has been used for sabre rattling several times in recent months, especially in the strategic Strait of Hormuz where it faces powerful American naval forces. A series of assassinations in Iran of nuclear scientists, and terrorist attacks against Israeli diplomats in New Delhi and Bangkok in the past week, have raised tensions between the two enemies to new levels. Hours after the ships passed through the Suez Canal, the US National Security Advisor, Tom Donilon, arrived in Israel for talks with senior officials about Iran and the crisis in Syria. Senior US officials have warned in recent weeks that Israeli opinion is starting to favour the air strike option. However, the US Secretary of State, Hillary Clinton, and Catherine Ashton, the European Union’s foreign policy chief, voiced cautious optimism yesterday about the prospect of Iran returning to nuclear talks with six world powers. At a joint press conference they said they had received a promising new overture from Tehran. Mr Donilon’s visit came ahead of a visit to Washington by the Israeli prime minister, Benjamin Netanyahu, for White House talks with President Obama in early March, where the leaders are likely to focus on Iran and the failure to find a deal on resuming direct talks between Israeli and Palestinian negotiators. Meanwhile, on a visit to Tokyo, Israeli defence minister Ehud Barak said a nuclear-armed Iran would trigger an arms race in the Middle East. “Crippling” sanctions should be imposed on Tehran to force it to give up its atomic programme, he said. In The Daily Telegraph yesterday the Foreign Secretary, William Hague, also warned of the danger of a nuclear Cold War in the Middle East because of Iran’s nuclear programme. A life on the high seas: John Fairfax stands beside his 22-foot rowing boat, Britannia, at King George V Dock in London, prior to sailing to the Canary Islands from where he rowed to Miami. He crossed the Atlantic because it was there, and the Pacific because it was also there. He made both crossings in a rowboat because it, too, was there, and because the lure of sea, spray and sinew, and the history-making chance to traverse two oceans without steam or sail, proved irresistible. In 1969, after six months alone on the Atlantic battling storms, sharks and encroaching madness, John Fairfax, who died this month at 74, became the first lone oarsman in recorded history to traverse any ocean. 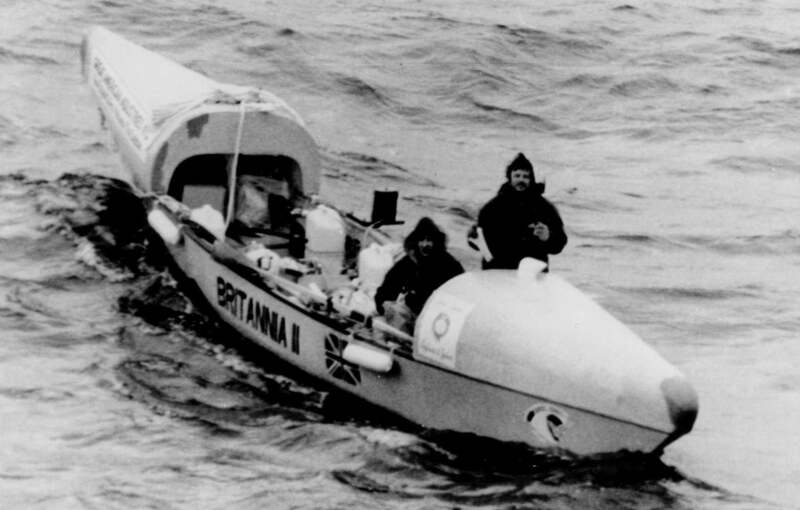 In 1972, he and his girlfriend, Sylvia Cook, sharing a boat, became the first people to row across the Pacific, a yearlong ordeal during which their craft was thought lost. Both journeys were the subject of fevered coverage by the news media. They inspired two memoirs by Mr. Fairfax, “Britannia: Rowing Alone Across the Atlantic” and, with Ms. Cook, “Oars Across the Pacific,” both published in the early 1970s. Fairfax powered his 22-foot (6.7 metre) rowboat "Britannia"
Mr. Fairfax died on Feb. 8 at his home in Henderson, Nev., near Las Vegas. The apparent cause was a heart attack, said his wife, Tiffany. A professional astrologer, she is his only immediate survivor. Ms. Cook, who became an upholsterer and spent the rest of her life quietly on dry land (though she remained a close friend of Mr. Fairfax), lives outside London. For all its bravura, Mr. Fairfax’s seafaring almost pales beside his earlier ventures. Footloose and handsome, he was a flesh-and-blood character out of Graham Greene, with more than a dash of Hemingway and Ian Fleming shaken in. At 9, he settled a dispute with a pistol. At 13, he lit out for the Amazon jungle. At 20, he attempted suicide-by-jaguar. Afterward he was apprenticed to a pirate. To please his mother, who did not take kindly to his being a pirate, he briefly managed a mink farm, one of the few truly dull entries on his otherwise crackling résumé, which lately included a career as a professional gambler. Mr. Fairfax was among the last avatars of a centuries-old figure: the lone-wolf explorer, whose exploits are conceived to satisfy few but himself. His was a solitary, contemplative art that has been all but lost amid the contrived derring-do of adventure-based reality television. The only child of an English father and a Bulgarian mother, John Fairfax was born on May 21, 1937, in Rome, where his mother had family; he scarcely knew his father, who worked in London for the BBC. Seeking to give her son structure, his mother enrolled him at 6 in the Italian Boy Scouts. It was there, Mr. Fairfax said, that he acquired his love of nature — and his determination to bend it to his will. On a camping trip when he was 9, John concluded a fight with another boy by filching the scoutmaster’s pistol and shooting up the campsite. No one was injured, but his scouting career was over. His parents’ marriage dissolved soon afterward, and he moved with his mother to Buenos Aires. A bright, impassioned dreamer, he devoured tales of adventure, including an account of the voyage of Frank Samuelsen and George Harbo, Norwegians who in 1896 were the first to row across the Atlantic. John vowed that he would one day make the crossing alone. At 13, in thrall to Tarzan, he ran away from home to live in the jungle. He survived there as a trapper with the aid of local peasants, returning to town periodically to sell the jaguar and ocelot skins he had collected. He later studied literature and philosophy at a university in Buenos Aires and at 20, despondent over a failed love affair, resolved to kill himself by letting a jaguar attack him. When the planned confrontation ensued, however, reason prevailed — as did the gun he had with him. In Panama, he met a pirate, applied for a job as a pirate’s apprentice and was taken on. He spent three years smuggling guns, liquor and cigarettes around the world, becoming captain of one of his boss’s boats, work that gave him superb navigational skills. When piracy lost its luster, he gave his boss the slip and fetched up in 1960s London, at loose ends. He revived his boyhood dream of crossing the ocean and, since his pirate duties had entailed no rowing, he began to train. He rowed daily on the Serpentine, the lake in Hyde Park. Barely more than half a mile long, it was about one eight-thousandth the width of the Atlantic, but it would do. Swimmers met John Fairfax and his 22-foot rowboat, the Britannia, in Hollywood, Fla., in 1969. On Jan. 20, 1969, Mr. Fairfax pushed off from the Canary Islands, bound for Florida. His 22-foot craft, the Britannia, was the Rolls-Royce of rowboats: made of mahogany, it had been created for the voyage by the eminent English boat designer Uffa Fox. It was self-righting, self-bailing and partly covered. Aboard were provisions (Spam, oatmeal, brandy); water; and a temperamental radio. There was no support boat and no chase plane — only Mr. Fairfax and the sea. He caught fish and sometimes boarded passing ships to cadge food, water and showers. The long, empty days spawned a temporary madness. Desperate for female company, he talked ardently to the planet Venus. 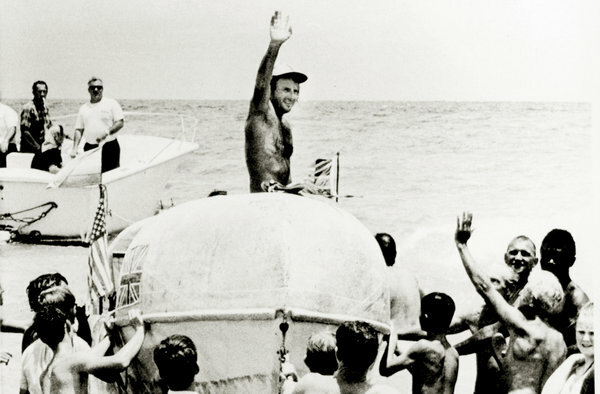 On July 19, 1969 — Day 180 — Mr. Fairfax, tanned, tired and about 20 pounds lighter, made landfall at Hollywood, Fla.
“This is bloody stupid,” he said as he came ashore. Two years later, he was at it again. This time Ms. Sylvia Cook, a secretary and competitive rower he had met in London, was aboard. Their new boat, the Britannia II, also a Fox design, was about 36 feet long, large enough for two though still little more than a toy on the Pacific. “He’s always been a gambler,” Ms. Sylvia Cook, 73, recalled by telephone on Wednesday. Their crossing, from San Francisco to Hayman Island, Australia, took 361 days — from April 26, 1971, to April 22, 1972 — and was an 8,000-mile cornucopia of disaster. “It was very, very rough, and our rudder got snapped clean off,” Ms. Cook said. Mr. Fairfax was bitten on the arm by a shark, and he and Ms. Cook became trapped in a cyclone, lashing themselves to the boat until it subsided. Unreachable by radio for a time, they were presumed lost. For all that, Ms. Cook said, there were abundant pleasures. “The nights not too hot, sunny days when you could just row,” she recalled. Mr. Fairfax was often asked why he chose a rowboat to beard two roiling oceans. “Almost anybody with a little bit of know-how can sail,” he said in a profile on the Web site of the Ocean Rowing Society International, which adjudicates ocean rowing records. Such battles are a young man’s game.With Ms. Cook, Mr. Fairfax went back to the Pacific in the mid-’70s to try to salvage a cache of lead ingots from a downed ship they had spied on their crossing. But the plan proved unworkable, and he never returned to sea. In recent years, Mr. Fairfax made his living playing baccarat, the card game also favored by James Bond.Baccarat is equal parts skill and chance. It lets the player wield consummate mastery while consigning him simultaneously to the caprices of fate. After a successful first edition in April of 2010, and in response to the praise and enthusiasm of the participants, the organization organized its second edition in 2011. Les Voiles de Saint Barth is a five-class regatta encompassing the most modern yacht as well as the classics, super yachts and multihull. The event brings together some of the oldest vessels and personalities in the Caribbean with some of the most state of the art boats and the youngest most accomplished new generation of sailors. George David’s Rambler 100 with Ken Read as skipper, got away at the pin end of the starting line and lead Hugo Stenbeck on Genuine Risk up into the outer harbor to an offset turning mark.